Everybody loves Full Moon movies, right? Those of us who are of a certain age whereby we really do remember the '80s and early '90s without the aid of rose-tinted spectacles grew up renting everything that Charles Band managed to get onto the shelves of our local video rental stores, and we thoroughly enjoyed doing so. As rentals turned into PVTs, we all went a little bit crazy buying up the big-boxed B movies of our teens. We never thought they'd be worth anything, we just had to have them, and we replayed them to death. But time moves on, unfortunately. Our once great collections of VHS tapes are now rotting in their boxes, or being sold in yard sales, and we've got huge DVD collections instead. The trouble with collecting Full Moon movies again on DVD, though, has always been two-fold. First, there's just so damned many of their movies to buy, and second, a semi-cultish following has helped to keep the prices up. Both aspects are great for Full Moon of course, but not for anybody with limited funds (and space) who is trying to collect their products. Maybe you've wanted to upgrade your Empire/Full Moon favourites to DVD, but thought it was too expensive to buy the box sets? Maybe you've missed out on a few of the newer Full Moon titles too? Well, thanks to a distribution deal with Echo Bridge Home Entertainment which has been going on for the last couple of years, there's actually no need to bankrupt yourself. For only $55 (plus tax) and a trip to Kmart, you can have all the good ones again, plus a load of crappier horror movies which you'll probably never watch. 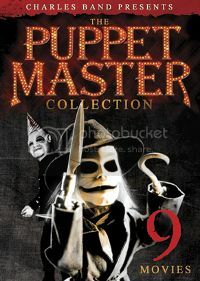 The first thing you'll want to buy is a big pack of "Puppet Master" movies. 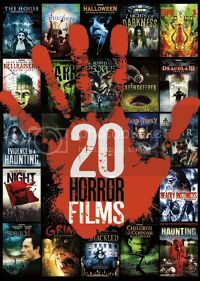 These are the most famous Full Moon movies, and you can't call yourself a horror fan if you don't have them. In their wisdom, Echo Bridge Home Entertainment have created two packs to choose from which are both priced at $5 each (except online! ), so the only thing you need to decide is if you want the three "Killjoy" movies as a bonus. If you choose not to buy the "Puppet Master and Killjoy' collection, you can get the "Killjoy" movies as part of the "Death comes in 3s" pack along with the first three "Gingerdead Man" movies and the "Demonic Toys" trilogy. What a bargain! Even if the newer Full Moon movies aren't to your taste, you can at least check them out for only $5. That's less than a bag of beef jerky and a fizzy drink to wash it down with! You may also want to collect the triple pack of "Deadly Dolls" movies (which I've only added to keep my pairs of pictures even!) despite double-dipping on "Demonic Toys 2", but don't do it unless you absolutely must have the bonus "When Puppets and Dolls Attack!" featurette. You need to slow down in your excitement! I'll tell you why later. Moving on to the more important sets, the first three "Subspecies" and "Trancers" movies are exactly what they say on the box. They are barebones versions with no frills or extras, but you can't go wrong for $5 each from the bargain bin. 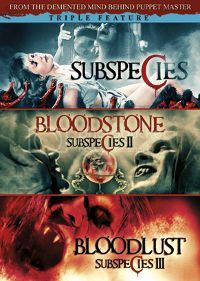 With only one more "Subspecies" movie, and three more "Trancers" movies left, you can complete each series by buying them from Full Moon Direct, Amazon, eBay, or anywhere else, and still know that you've saved money. 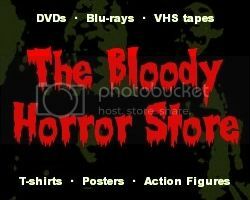 Remember our old friends the "Midnight Horror" collections? If you haven't already got them, you'll need these for "Evil Bong", "Demonic Toys", "Meridian", and "Decadent Evil" (in Volume 1), or "Evil Bong II: King Bong", "Demonic Toys 2", and "Doll Graveyard" (in Volume 2). You can also get the latter three and "Decadent Evil" in Volume 3, but let's not confuse things any more than Echo Bridge Home Entertainment already have done. 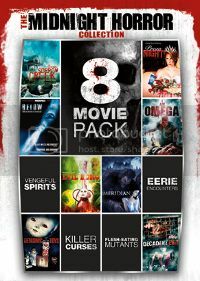 Finally, these two "expensive" $10 multipacks containing "20 Horror Films" each will provide you with the "Dangerous Worry Dolls" movie from the triple pack—which I told you not to buy—as well as "Seed People", "Evil Bong 3: The Wrath of Bong", "Lurking Fear", "Head of the Family", "Dollman", "Vampire Journals" (a spinoff of "Subspecies"), "Netherworld", and "Doll Graveyard" again. 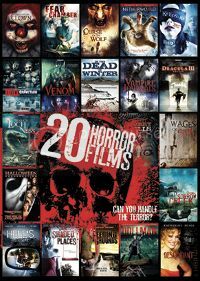 Sadly, there will always be repetition with Echo Bridge Home Entertainment's horror movie collections, but on the bright side, only having one double-dipped movie can be considered negligible. For that reason, I've avoided listing "Castle Freak" and "The Pit and the Pendulum" which are also available in multipacks but not together. As for the "When Puppets and Dolls Attack!" featurette, it'll be available on Full Moon's streaming site - http://fullmoonstreaming.com - which you can join for only $6.99 a month. Of course, most of the movies above will also there, so you may not want them on physical media either. At the end of the day, it's all down to how much of a collector you are. Although there's a very slight possibility that more Full Moon movies may appear in Echo Bridge Home Entertainment DVD packs in the future, if you buy this lot, you will have 43 of them to start you off. 43 Full Moon movies! That'll keep you busy for a while!